The Sony Ericsson Xperia Play, dubbed the PlayStation phone, leaked already countless times before its upcoming announcement at the MWC Expo this month. It was even thoroughly previewed a few times, including the game play with legacy PS titles. Only a few unknowns still stay, like which exactly of the second generation Snapdragon chipsets is inside, and what titles will it ship with preinstalled. 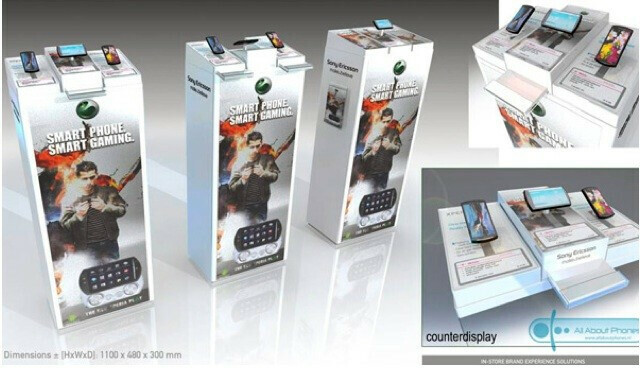 Now thanks to a leaked display stand, probably for Sony Ericsson's booth at the MWC Expo, we know the marketing slogan. 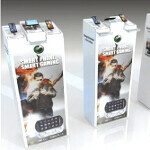 "Smart Phone, Smart Gaming" is the new catchphrase coined by the PR people at Sony Ericsson. We'll reserve judgement until we see the quality and number of titles that will be available at launch for this gaming handset in the dedicated section of Android Market, as well as the gameplay itself. i want this phone, i just hope it comes to CDMA and really takes off, unlike the PSP go it resembles when open. I think that it might be safe to say that this will be the first phone to have that PlayStation app that Sony announced last week. Hopefully it'll come with a MSM8655 (Thunderbolt), MSM866 (HP Palm Topaz Tablet), or QSD8672 processor. Is Sony Ericsson handing out cash bonuses to take these off their hands? or How about a refund for everyone who owns an X10 device not getting Froyo (or Eclair if you're lucky)? or How about a swap for my old P990 which never had crash free, hardware compatible and fully working firmware? or How about an apology to right all the lies, broken promises and wrongs of the past?? Be honest with yourself. You were a mug to buy the P990, it had no use. Touch screen, stylus and detachable keyboard. Completely pointless and you were silly to have wasted like $400 on it (possibly more). Next, you were silly to buy the X10, everybody knows that HTC were producing better android phones at the time that came out. This, however, looks a solid product. I'm not going to give up my phone for it, but it would definitely be cool to have proper gaming on a phone without having to use a stupid touch screen. Only disappointment is the touch-sensitive-joystick/anologue stick thing.. original photos made it look like they had created a shallow actual moving analogue stick which i'm sure i would have preferred.